Recently, I have watched a presentation by Brian Mann Testing, the way it should be that shows a new tool, currently in private beta for open source projects. The presentation shows how functional web testing could work if we designed a testing tool with the developer in mind. The tool is called Cypress; and after trying it on several of my own open source projects I must say: I have experienced the testing nirvana and so can you. The tool is almost magical in its simplicity and power. Painless installation with npm i -g cypress-cli && cypress install. Then start the tool and login using your GitHub account (the tool is in private beta). The test runner is framework-agnostic. I have used Cypress to test server-side rendering project and a vanilla JS library. The tests themselves use Mocha (my favorite!) and BDD assertions. The runner understands promises and automatically waits N (10 by default) seconds when checking element's presence / url / etc. This is huge, since it removes a lot of flaky boiler plate logic from the tests that deal with unpredictable timing in the real world. I have a simple server-side rendered application showing Todos todomvc-express. The functional tests require starting the server first. On Travis CI I start the server in the background and then run the functional tests. 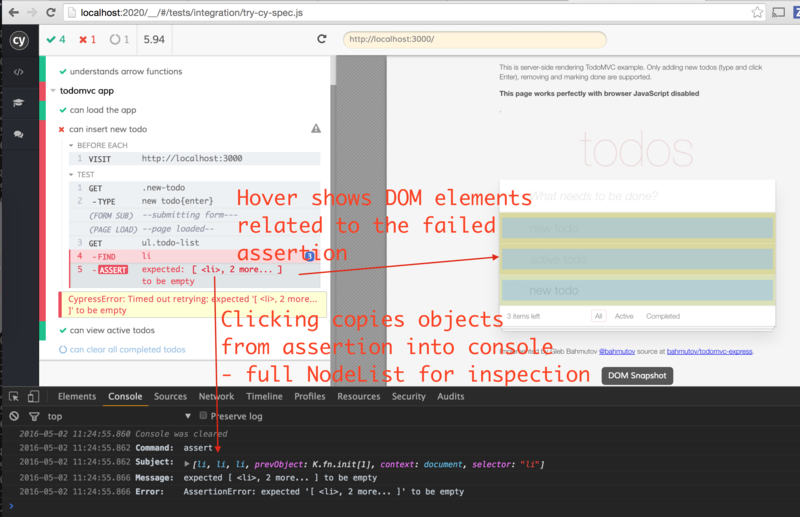 Running the tests provides a huge amount of additional information - each step is displayed in the list on the left, each step has before and after DOM snapshots that I can inspect, and each object (like the NodeList selected using .find('li')) expression) can be inspected in the browser's console by clicking on it. The tests can be opened in the multiple browsers by pointing at the same top URL (like http://localhost:2020/__/#/tests/integration/try-cy-spec.js in this case) and the tool reruns all tests in all browsers on source file changes. Note that it includes tiny-toast.js from the repo's root dist folder. Yet Cypress loads everything without a trouble. To avoid boilerplate code, we can use Underscore property access (Underscore is bundled into Cypress tools together with jQuery, momentjs, and a few other popular utilities). In the above code the command .contains('h3', 'test messaage') finds H3 tag with the given text contents, which should become visible after we execute tinyToast.show(...). 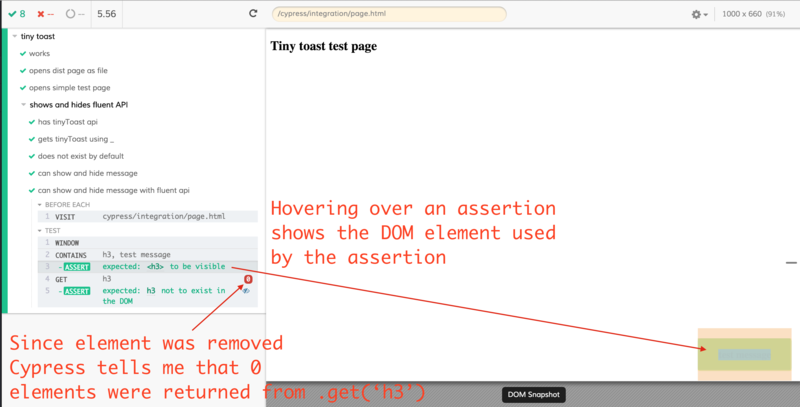 Then the element should be removed from DOM after 2 seconds controlled by .hide(2000). The Cypress test page again provides extra useful information for each test statement. 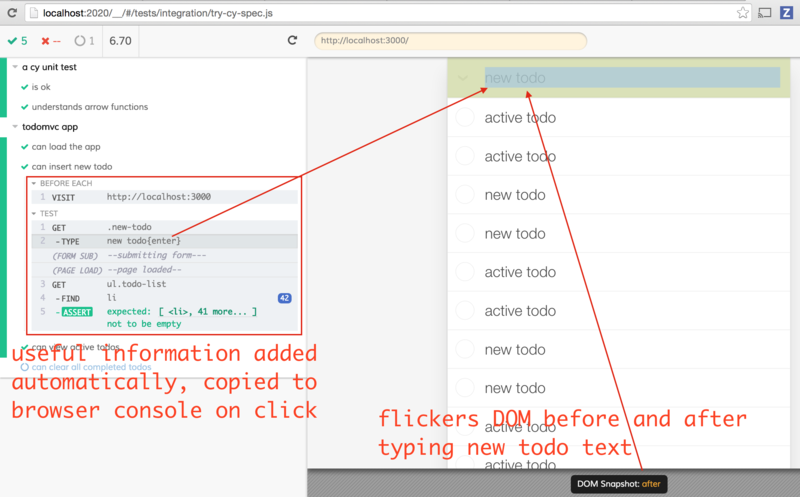 Hovering over each assertion brings the before / after DOM snapshots with the changed elements highlighted. Additional information is automatically displayed for .get() commands, like the number of found elements (zero in this case). Working with Cypress has been a great pleasure. It shows that there is plenty of room for improvement in functional testing for web applications, one just needs to have a strong desire to identify and solve developer's pain points.